he principal opposition party in India. He also heads BJP's Information Communication Campaign Committee that oversees all outreach efforts of the party via web, mobile and social-media. second rank holder in Law in Mumbai University. is currently pursuing the Owner / President Management (OPM) Program at Harvard Business School. A well-known investment banker, he has advised top corporates on management strategy and growth; also served on the Board of India’s largest commercial bank, the State Bank of India and Bank of Baroda. Piyush is a member of the Parliamentary Standing Committee on Finance and the Consultative Committee for the Ministry of Defence. An active member of the Managing Committee of Indian Merchants Chamber, he is also involved with NGOs in diverse fields such as tribal education and welfare of the physically challenged (Jaipur Foot). During his 27 year long political career, he has served on the National Executive and held several important positions in the BJP. He was also nominated by the Government of India to the Task Force for Interlinking of Rivers. He was the Dy. Campaign In-charge for the Parliament elections in 1991 and played a key role at the central level in all elections since 2004. I watched the video few days back.. Will search and post for you. It was in the Madhu Kishwar interview of him. lo bhaya dekh lo macho Barkha Dutt ke karname..
That was Modi in an informal conversation with Madhu Kishwar, journalist and social activist. Please do note, Modi says he called either Rajdeep or Barkha to tone down their inflammatory reporting. Neither of them has denied this. Kahaan Outdated Rajdeep and Barkha. Modi baiters have gone international now. First Economist says 'India deserves better' ( but then, there is no one better now). And of late Guardian has come up with a few articles which are actually being reused by Congress. Before people start criticizing, 'Imperialist western media', let me step in that these are actually 'Left wing British media'. I have not found anything like that in say, Foxnews. ya.. also, this plagiarist Fareed Zakaria (emigrated Indian) is also of the same gang. I used to respect him earlier when he spoke in tough tone about Pakistan. But I heard he is now on the panel of Rahul's advisers, those writing speeches and picking issues for him to speak on, Rahul is being tutored to be able to deliver speeches and increase his knowledge, IQ. But all that is of no use.. In a March 1 conversation with Poloff, influential columnist and political insider Saeed Naqvi commented on Rahul Gandhi at some length. Naqvi prefaced his remarks by noting that he was a personal friend of Rahul's father, Rajiv Gandhi, and a well-wisher of the Gandhi family. Naqvi was initially delighted when Sonia Gandhi projected Rahul as the heir apparent, but has since lost faith. He claims that the word among Congress insiders, including those in the coterie surrounding Sonia Gandhi, is that Rahul will never become Prime Minister for several reasons. Saying that he "refused to indulge in gossip," Naqvi claimed that it is increasingly common knowledge that Rahul suffers from "personality problems" of an emotional or psychological nature that are severe enough to prevent him from functioning as PM. "We will introduce Prime Minister Gram Sichai (irrigation) yojana for our farmers," Modi said. Narendra Modi on Tuesday promised to revive programmes of Atal Bihari Vajpayee government and revise the minimum support price (MSP) given to farmers, if voted to power. “On the model of Prime Minister Gram Sadak Yojana (launched during the Vajpayee regime), we will introduce Prime Minister Gram Sichai (irrigation) yojana for our farmers,” Modi said in his poll meeting here. Stating that the current MSP on foodgrains produce was not uniform across the country, he promised guidelines that would help the farmers in the country uniformly. Apparently responding to Union Minister Jairam Ramesh’s recent allegation that BJP had now become Modi-centric, the BJP’s prime ministerial candidate mentioned senior party leaders L K Advani, Arun Jaitley and Murali Manohar Joshi and said all of them were working for the party. Improving Rural infrastructure is good vision. MSP is good selling to Farmers. But Modi could check with BJP Ally Sharad Joshi, who has some ideas that Free economy is the best way for Farmers. One thing from ABV govt Modi could complete is the Golden Quadrilateral and the North South East West Highway projects. After the UPA replaced ABV posters with MMS and Madame posters, the project has been perpetually 95% complete. 'Modi is not a politician. He is a Statesman'. P.S. You have to click 'I agree' to be able to watch the video. I wish Gpeika pai can see this video... maybe he will understand my arguments with him. 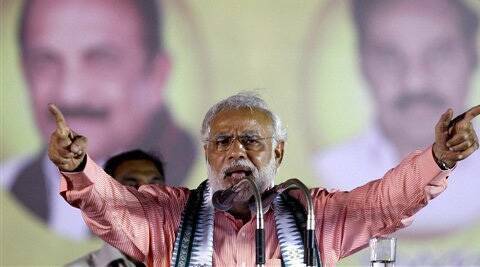 But there is a clear risk in voting for Modi — he is polariz ing, sectarian and authoritarian. There is a great er risk, however, in not voting for him. It is to not create jobs for 8-10 million youth that enter the market each year. Narendra Modi, prime ministerial candidate for Bharatiya Janata Party (BJP) and Gujarat's chief minister, addresses his supporters during a rally in Amroha, Uttar Pradesh March 29, 2014. NEW DELHI (Reuters) - India will get tougher on territorial disputes with China and in its old rivalry with Pakistan if opposition leader Narendra Modi becomes the prime minister in May after a general election, two of his aides said. Modi, a Hindu nationalist who is the front-runner to win the five-week election starting on April 7, has taken an aggressive tone against the two neighbouring nations. On the campaign trail, he has warned Beijing to shed its "mindset of expansionism" and in the past he has railed against Pakistan, an Islamic state, for attacks by Muslim militants in India. 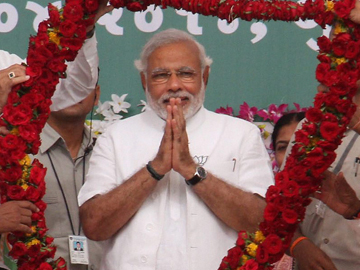 BJP's Prime Ministerial candidate Narandra Modi being garlanded during an election rally in Himmatnagar, Gujarat. New Delhi: Pakistan today said it was "encouraged" after BJP's Prime Ministerial candidate Narendra Modi's remarks regarding ties with foreign countries and asserted that it was looking forward to a stable government here to engage "quickly, comprehensively and meaningfully". Making a strong pitch for resumption of dialogue process, Pakistan High Commissioner Abdul Basit said talks were the only way to resolve outstanding issues and no one nation does any "favour" by talking, indicating that stopping of talks by India was not good for bilateral ties. Interacting with women journalists, Mr Basit also said his government was committed to change the bilateral narrative of conflict into one by cooperation and mutual trust. India would be very bad if your salary has not increased. Now, you have not mentioned that. Mentioning the salary for the same designation would be an objective compare. Tax has actually risen in many ways during UPA 1 and 2. It started with 1% eduational cess. The service tax had gone up from 5% in 2004 to 12% 2009 (when i traveled to XLOO). And there is this 'Fringe Benefit Tax'. All this is to finance all these yojanas. What Modi is pitching is that it is growth with lower taxes which might help the poor and not these freebies. And he seems to be succeding where Babu has failed. Now, on what this XLOO is . This is the Ex Land of Opportunity, the US of A. Now, if India has been bad, US was worse to many in 2008 and 2009. Here, Diesel is costlier than Gasoline in most of the places. The salary hikes are mostly in single digits even in good times for most. Even under the slowed down growth, India is still growing at a faster rate than US (4% vs 1%). The interest rates are low, both when you borrow or save. But when i landed up here, Rupee was 40 to a dollar, now it is 60 or so. This means i am able to payoff my home loan faster. It is true that salaries are stagnant in US, so one must be smart and change jobs if need be. One hardly notices the inflation in US since you keep using plastic, but it is rising for sure.